The Clermont Soil & Water Conservation District (SWCD) will continue to offer assistance to agencies, local governments and landowners with the ongoing efforts to eradicate the Asian Longhorned Beetle (ALB) pest from Clermont County. It is a resource issue of utmost concern to the District. While Clermont SWCD has no authority in the eradication effort and cannot dictate eradication strategies, it has the responsibility to assist the U.S. Department of Agriculture (USDA), its contractors and landowners with all efforts relative to the conservation and wise use of local natural resources. The District has an obligation to look out for the interests of landowners and resources within the current ALB infestation zone, as well as those throughout Clermont County. Conservation is a focus of all our programs at Clermont SWCD, including our quarterly newsletter! To save paper, we will be switching to an electronic format in 2016. Our last full print edition will be our Autumn 2016 newsletter. The Winter edition will be in an electronic format. 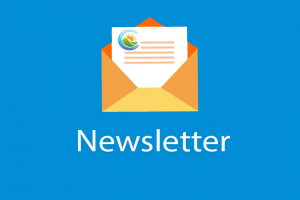 You can sign up to receive the electronic newsletter here, or simply call the office. If you wish to continue receiving the printed version, please call us at 513-732-7075 ext. 2, or email ssteffensen@clermontcountyohio.gov. We’ve found some interesting stuff over the years of the Spring Litter Cleanup, but this year’s find may be the best. 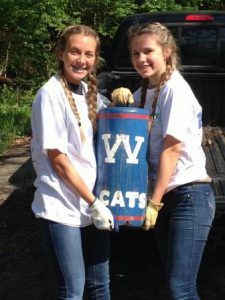 Two Western Brown students found the bell used by Williamsburg High School during football games when the Wildcats score a touchdown. The school was very happy to have the bell returned. 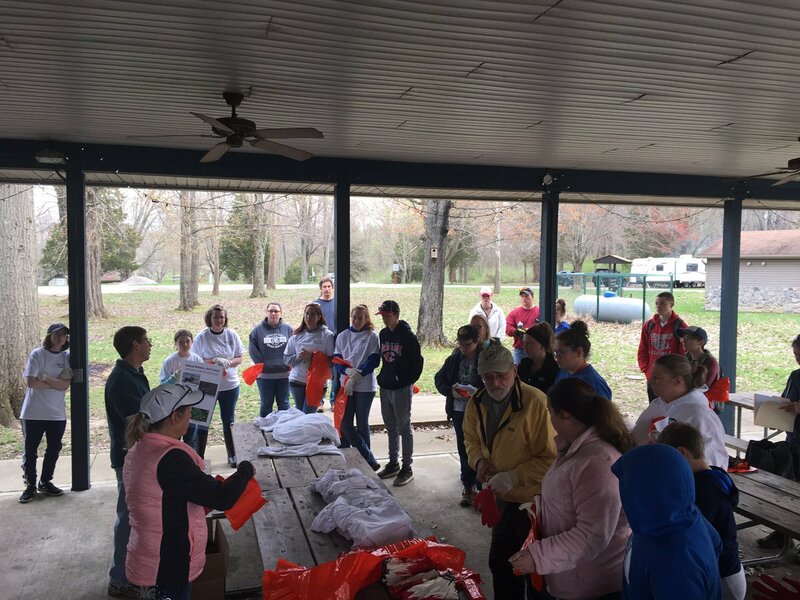 So if you’re missing something, you may want to join us for the 2017 Spring Litter Cleanup! A successful pond is only as good as proper pond construc­tion and proper construction begins with the knowledge of the builder. A pond should have 25% of its basin at a depth of eight feet or greater and side slopes at a 3:1 ratio (three feet out, one foot down). A minimal round pond size built to this spec. will be approx. 100 feet in diameter. This does three things, it gets you into deeper water quickest while maintaining a stable slope on your bank, creates “open water” on your pond and provides proper habi­tat for spawning. Shallow water (usually three feet or less) is where a majority of your plant life establishes, especially algae, and minimizing these areas will decrease the occurrence of nuisance plant problems. Some plant life in your ponds is needed to add oxygen, uptake nutrients, and provide habi­tat for your fish and other beneficial organisms that make a pond function. Also, there will be enough shallow areas around your pond for spawning without the need to create additional shallow water habitat. Excessive weeds can make a pond less enjoy­able and harmful to your fish. Over time ponds will fill in with silt and organic material, making the ratio of shallow water to deep water less and will need to be cleaned out to function as designed. An older pond has a greater chance of having vegetation problems because of this accumulation of material. Ponds act as a sink to store organics, nutrients, and sometimes pollutants that find their way in. The dynamics of a pond also slow because of this excess ma­terial, making it easier for vegetation to establish and quickly spread. If you are having trouble with vegeta­tion in your pond, it is likely the pond was not constructed with enough open water or your pond is aging and becoming less efficient at nutrient cycling. If you want a smaller pond, take into consideration vegetation management during planning. If you would like an assessment of your pond, please call our office to set an appointment with Jake Hahn at 513-732-7075 x-4. A new program will soon be available to help Clermont County farmers apply conservation practices to reduce the runoff of sediments and nutrients in the East Fork Lake watershed. The Clermont Soil & Water Conservation District (SWCD) was recently awarded a five-year, $600,000 grant through the U.S. Department of Agriculture’s Resource Conservation Partnership Program. Clermont SWCD was one of only two districts in Ohio to receive funding through this nationwide $370 million grant. Under the grant, farmers in the drainage area upstream of the lake will be eligible to receive financial assistance to plant cover crops, filter strips, grassed waterways and other methods that help hold soil on the farm and prevent nutrients and other pollutants from washing into nearby waterways that eventually drain to the lake. Excess nutrients, such as nitrogen and phosphorus, are thought to be the most significant factor contributing to the harmful algal blooms that have been appearing each summer in the lake since 2012. The soils in this region erode quite easily and contribute to the problems we see. Farmers do a good job with this ground. Adding conservation practices through this grant will help them improve infiltration rates and hold more soil in place, which will not only improve water quality, but also their crop yields over time. For several years, Clermont SWCD and its partners in the East Fork Watershed Cooperative have been working together with local farmers to improve the quality of farm fields through the use of conservation practices. As recently as 2011, nobody was planting cover crops in Clermont County. Our local farmers have really stepped up. This year, over 2,500 acres have been planted. This grant will really help us expand our conservation efforts in an area that needs it most. The first sign-up for farmers to participate in the program will likely be announced in spring. Interested farmers should watch www.clermontswcd.org for announcements, or call 513-732-7075 for more information. Ever wonder how clean our water resources are? Is the water safe to drink? Is it ok for my children to swim in the river? Or is the river healthy enough to fish from? Thanks to the Clean Water Act (CWA) the answers to these questions aren’t hard to find. 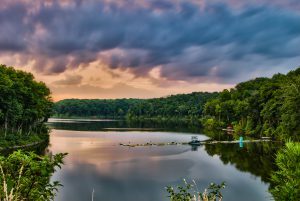 Under the CWA, the U.S. Environmental Protection Agency (EPA) is tasked with keeping Ohio’s waters fishable swimmable and drinkable and each state has adopted standards to measure how water bodies are meeting these goals. Ohio EPA (OEPA) uses a set of standards coined biocriteria to determine whether a stream meeting the fishable goal. In other words they look at the health of the fish and macroinvertebrate communities to identify if a stream has poor water quality or other impairments. If a river is determined to be impaired then OEPA develops a Total Maximum Daily Load (TMDL) for that watershed where it identifies all of the sources of pollutants and puts daily limits on those sources in an effort to clean up that river. 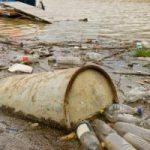 Enforcement of those limits could include pollutant load reductions from point sources of pollution, such as waste water treatment plants, or implementation of Best Management Practices (BMPs) for nonpoint sources, such as agriculture or urban runoff. In 2012 OEPA began their study of the East Fork of the Little Miami River, which is 80 miles long and drains a 500 square mile watershed. They sampled around 90 sites for chemistry, stream habitat and fish and macroinvertebrate health. The technical support document released by OEPA names the principal cause of impairment in the East Fork as organic enrichment, and to a lesser extent nutrient enrichment. Nutrient enrichment can come from leaky sewers, the over application of fertilizers and sometimes even natural sources such as soil types high in phosphorus. Organic enrichment can come from natural sources such as decomposing plant material, or unnatural sources like sewage or manure. Organic enrichment is harmful to aquatic life, such as fish and macroinvertebrates, because bacteria consume oxygen while processing organic materials, leading to oxygen stress on aquatic life. Nutrients can also cause oxygen depletion by encouraging the overgrowth of algae, which consume oxygen during nighttime respiration. In the East Fork, OEPA identified wastewater treatment plants and nonpoint source pollution from agriculture and on-site sewage systems as the sources of organic and nutrient enrichment, but the plan for addressing these pollution sources (TMDL) isn’t expected to be released until the spring of 2015. This plan will be in draft form and there will be a comment period during which stakeholders can express their concerns or comments with OEPA. Despite the state being responsible for regulating pollution sources in the East Fork watershed, local stakeholders are taking a very active role in the outcome of the TMDL and how the watershed is managed. The East Fork Water Quality Cooperative, comprised of Natural Resources Conservation Service, US Environmental Protection Agency, Farm Services Agency, US Army Corp of Engineers, USGS, and Clermont County SWCD and Office of Environmental Quality, have been pooling resources to assist in determining the causes and sources of water quality impairment in the East Fork Watershed since 1996. Much of the data collected by the Cooperative is being used by the state in development of the TMDL. Additionally we’re using data collected at small spatial scales, i.e. individual properties, to determine if we can cost effectively improve water quality in the East Fork River by strategically placing best management practices in areas that are sources of the highest amount of pollutants. The Cooperative is also very interested in improving water quality in Harsha Lake which is a recreational resource and a drinking water source for approximately 100,000 residents of Clermont County. By pooling resources and working closely with farmers and water resource managers, the Cooperative is at an advantage in ensuring we have a healthy watershed for everyone to enjoy. Could Your Farm Benefit From a Watering System? The Conservation Reserve Program offers about 90% cost share on watering system practices. Yes that’s right, 90%! These practices include spring developments, pumps to distribute water from a pond or from county water hookups, pipelines, and different types of watering troughs (frost-free waterers, concrete tanks, portable plastic tanks, etc). This program, unlike others that are offered through the United States Department of Agriculture, is non-competitive. This means that if you qualify for eligibility, then offers are automatically accepted. All you need to do is be willing to fence out your stream from livestock. The minimum buffer width is 20 feet and can go up to 120 feet. 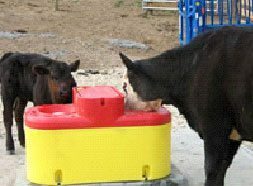 By restricting access to surface water on your property and giving your livestock a clean source of water to drink from, chances of sickness from pathogens are greatly reduced. Livestock illnesses associated with polluted water include: mastitis, scours, lepto, cryptosporidiosis, and foot rot. Nitrates in water can also reduce lactation, lower blood pressure and cause anorexia. The danger of injury or death from falling on streambanks or even drowning will be nonexistent when your livestock are excluded from these areas. CRP will also cost share 90% on fencing for livestock exclusion. Other practices CRP reimburses 90% include stream crossings for stable access to pasture fields, gravel heavy use pads around watering troughs, and trees, shrubs, or native grasses that you choose to plant inside the buffer area. Besides the cost share that is reimbursed, there is also a one time incentive payment when you sign your contract, and an annual rental payment on the buffer area for 10 or 15 years, depending on the length of your contract. Maintenance payments will also be made to help with upkeep of certain practices. If you would like to learn more about this exciting opportunity please call Steve Anderson with Farm Service Agency at 513-732-2181 ext. 2 or Lori Hillman with Natural Resources Conservation Service 513-732-2181 ext. 3. We look forward to hearing from you! Many different plants grow in and around the pond. They convert sunlight energy into organic materials; the basis for dissolved oxygen in your pond. When there is an overabundance of plants, they become aquatic weeds. Control of aquatic weeds can be tough, especially algae. There are two types of algae, filamentous and planktonic. Filamentous is often seen as a yellowish green mat on the surface. This algae starts life on the bottom of the pond and feeds on oxygen as it nears the top. This occurs after very low levels of water allow the algae to be exposed on the bottom or disturbance causes it to break free from the bottom and circulate through the water. Planktonic algae is a microscopic plant floating in the upper few feet of water. It appears as soup green, brown, or bright green colored paint split on the surface. Copper Sulfate is one method of algae control. Follow the label recommendations for best results and do not over apply. The Clermont SWCD, Clermont County Water & Sewer Dept., and Clermont County Commissioners are joining the Little Miami River Partnership, NRCS, FSA, ODNR and a host of other partners on a proposal that could attract nearly $90 million of federal funding to help protect the Little Miami River watershed. The funds would be used to put best management practices on critical agricultural lands along streams. A takeoff on the traditional Farm Bill program CRP, a CREP (Conservation Reserve Enhancement Program) can provide higher incentive payments and targets the most vulnerable agricultural lands along streams. Although these can be very productive farm lands, they are also subject to frequent flooding and excessive runoff and sediment loss, which can have a greater impact on stream quality than upland agriculture. The proposal process is very complex and could take nearly 18 months to complete. If USDA accepts the partnership’s proposal, the CREP program would be rolled out to landowners in the Little Miami River watershed shortly thereafter.